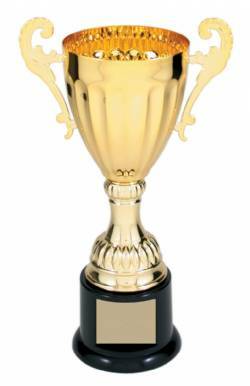 Series 300 Metal Cup Trophy - Gold - 8.75" to 14.5"
Metal Cup and Handles, Plastic Stem, Round Plastic Base. Square Plastic Base for Fantasy Sports League is also available. Square Base has main Front Plate and can hold 15 1/2"x3-7/8" Plates.